Review: Yoshii-kun is eager to do his best at the new high school he is going to attend. This high school is famous for its outgoing social and pedagogic practices. Students are divided into classes based on their entrance exam scores, where class A with the best scores is able to study in fancy classroom and enjoy upper class meals, while class F has to study under ridiculously poor conditions. Through special technologies the students are able to summon creatures with strength equal to their recent test scores and fight for the sake of switching classrooms with the loosing team. Unfortunately our Yoshii-kun ends up with one of the worst test scores, but at least he sees some familiar faces in class F. Maybe not all hope is lost. On first glance the concept of Baka to Test to Shokanju does seem a little too farfetched, but you just have to give it a try. 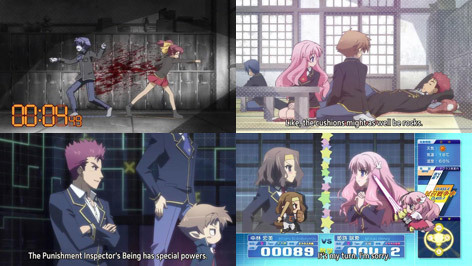 That show is by no means only about high school students fighting each others with tiny chiby figures. Nor does it have any deep meanings or dramatic moments; it’s just plain comedy. But that is exactly what it’s good at. This anime lives from its hilarious characters and at this point it’s so good that I even dare to compare it to classics like School Rumble. Review: Akira suffers from a loss of childhood memories, but with the help of his friends he is still able to live a normal high school life. However, his peaceful life suddenly changes after Mina Tepes starts to approach him. She is what appears to be the princess of all vampires and she is about to not only reveal the existence of vampires to the general public, but also with the help of her enormous financial backings create an independent city at the coast of Japan for vampires to gather and live in peace. As Akira spends more time with Mina he remembers he is from a werewolf clan serving under her and his memories slowly begin to return. Unfortunately the society of vampires isn’t as simply as to simply follow through with Mina’s goals and ambitions, so it seems Akira will have a lot of work on his hands. As a fan of the manga this anime is based on, I found the alterations Shaft made to the plot in the first episode to be rather absurd and unfitting. Luckily the following episodes compensate with high animation quality and a more down-to-earth plot. It’s an anime recommendable to all vampire/action/fantasy fans.